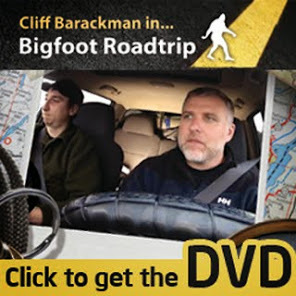 Having driven home from the Oregon Sasquatch Symposium the night before, I awoke in my bed shortly before 9 o'clock. 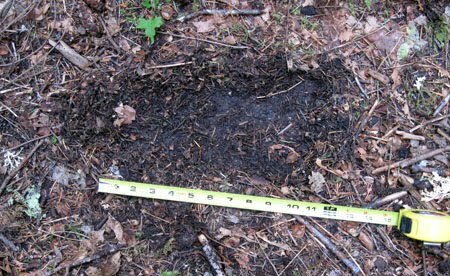 I had been told that the witness wanted to return to the site with somebody else to cast the footprint. Rich, my sheriff buddy, and I started calling the witness periodically while I started gathering up my bigfooting gear. The photo that sent me running. The witness' shoe is 12 7/8 inches long. I kept thinking about the photograph of what was clearly a sasquatch footprint. It was unknown how deep the heel impression was, but the toes looked beautiful. They were deeply impressed and the outer digits splayed nicely. Having looked at many photographs of footprints in the ground (and having actually taken several myself), I knew that footprints rarely photograph well. When I see a clear photograph such as this, the print itself must be of stellar quality. I will be adding the print to my online database as time permits. 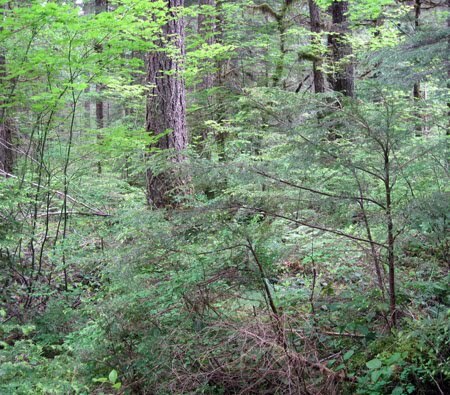 While I was working at home, I received several phone calls from friends at the Oregon Sasquatch Symposium. Some phone calls were asking why I left, other calls were telling me that Toby Johnson announced why I left from the podium (which put some pressure on me, but the truth is the truth...). One call was from a regular field partner of mine, Will Robinson. I asked if he'd like to come to help find the prints, and after a short deliberation he found himself driving home to meet me. Not being able to make contact with the witness, I decided to drive to Shelton, WA (where the witness lives) and wait for him to contact me. It was Father's Day, after all, and Rich was told that the witness had some previous holiday plans. I would also rendezvous with Will there. I arrived in Shelton around 2 o'clock. Phone calls were made trying to reach the witness, but with no success. Rich was doing his best to piece together exactly where the prints might be based on what he knew. After a coffee and a burrito, I waited in a park while pouring over maps that might give some clue as to the location of the prints. Not having been contacted by the witness, and with Will arriving in a few minutes, I decided to leave Shelton and head to the area to camp. Without the witness leading me to the tracks it would be next to impossible to find them, but the previous few hours of research had given me a good idea as to their general location. 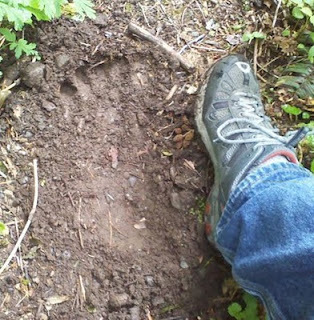 I knew finding the prints would be a long shot before I even left Eugene the night before (having chased down leads like this in the past, they almost never pan out), but what I did know was that a sasquatch had been there just a few days previously, probably on Thursday night. That put me on the ground in an area where I had a higher probability of obtaining video footage. As I approached the freeway to meet Will, the witness called me. He had gone to the site earlier in the day to show his wife the footprint, which was why he was unreachable. 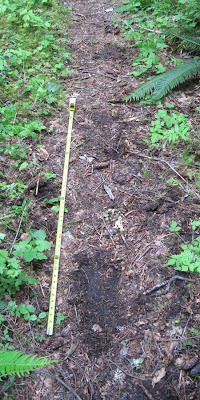 He reported that hikers had stepped on the prints, and he also gave a good description of the other impressions. Only the one footprint would have been castable, as the others were in thick forest litter. The others were clearly visible, yet no toe impression would be discernible. Where there is one print, there are more. Still wanting to take measurements and photographs, and to possibly find further evidence, I asked the witness for directions to the print site, which he gladly gave. It turns out that my guess as to where the location is was correct to within a mile or two. 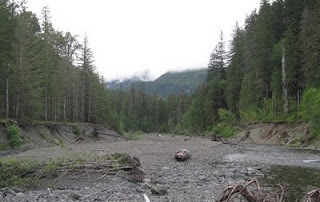 The next step of my adventure would take me to Church Shelter in the headwaters of the Skokomish River. I caught up to Will on Highway 101 and took the Skokomish River turn off. Our road would take us deep into the Olympic National Forest before finding the trail head parking for the shelter. From there, we went downstream, crossed the river, and looked for a tributary feeding the Skokomish from the left. This is the point at which a complication arose. There were no less than five tributaries along this small stretch of river. Which one would lead to the prints? Will and I chose one that looked easiest to navigate and headed up through the thick foliage. Devil's club, stinging nettle, and wild roses were only a few of the disagreeable plants we waded through as we found ourselves arriving on a boggy bench which fed the various tributaries. Though there were animal trails everywhere, very little ground showed itself on which to leave tracks. We hiked through the steep, wet understory of this quagmire for nearly an hour before we gave up. Hiking off-trail in the Olympics can be difficult. At one point Will commented on the irony of looking for footprints that aren't even there, and we laughed at the wild goose chase we were on. It's so important to keep a sense of humor about this hobby. Bigfooting is a crazy game that puts one in strange and uncomfortable places and situations. Without a sense of humor and a love for the journey itself, it would be easy to slip into a dark bitterness. As we made our way back to the vehicles, we came across impressions on the trail. The step length (not stride) was about three feet, which is pretty long, but the print size itself (just about twelve inches) was pretty standard for a human's boot. Due to the context being very close to the shelter, I have to assume these were human tracks, but I thought you'd like to see for yourself. Two photos of the [probably human] tracks. We made our way back to our vehicles and found a suitable camp location down a nearby spur road. We pulled out all the tricks that night: knocks, calls, yummy smells, night walks... We heard no responses except for several barred owls. As far as we could tell, no bigfoots were around. We eventually retired around 3 o'clock. This side trip took me away from the Symposium, but as Will and I discussed, if you don't chase down leads then you'll never get anything fresh. As evidence ages, information is lost. The best data is obtainable from the freshest leads. Without regrets, Will and I headed home. But this next stop on my squatch-a-thon is the subject for another blog post. Check back again in a few days for details and photographs from this sighting investigation. I enjoy your adventures so much. I send my readers to your site all the time. My girlfriend and I,9-25-10 was going to spend the night at skokomish pass. We were just over the river high up and could see the river.We set up camp with a tent and fire. About 11:55pm we heard branches being broken. We would yell out whooping noises real loud. We played a cd with voices of BF. We heard a lot of cracking wood. I heard one whoop that sounded far away at about 11:40pm. This was all coming from the over the ravine we were camped upon. About 1:30am right by me about 30ft. away we heard a growl-gurgaling-low-deep growl. That's when we decided to leave. This is all true. I had one in my back yard he stood about 7-8 foot tall with huge thighs on him he came down from my hill out back. I could see him because the moon was out and he was pitch black against the snow.I thought it was a prank until I found a footprint a couple of weeks ago what was left behind.